A common issue found in most arcade sticks is general compatibility. Going to tournaments or local practice sessions might have a console different from what you use with your stick, rendering it useless for that event. There are things that solve the problem including modding your existing stick with parts to making it compatible on both Xbox 360 and PlayStation 3 or getting a new stick compatible with the consoles right out of the box. In E3 2012, there was a device that caught my eye. Titled the Cronus Device, it's a USB solution that's meant to allow easy plug-and-play compatibility with an Xbox 360 controller on a PlayStation 3 and vice versa with no extensive modding and no apparent input lag. Aside from the compatibility, the ease of use being just a USB device looked impressive. Now the device is available but is it a good alternative for those who don't want to worry about wiring their stick's insides or buying a multi-console stick? As of now, this review will only cover support from Xbox 360 to PlayStation 3 due to lack of 360 support with PS3 sticks as of now. A firmware update to support PS3 sticks will be available later this year. 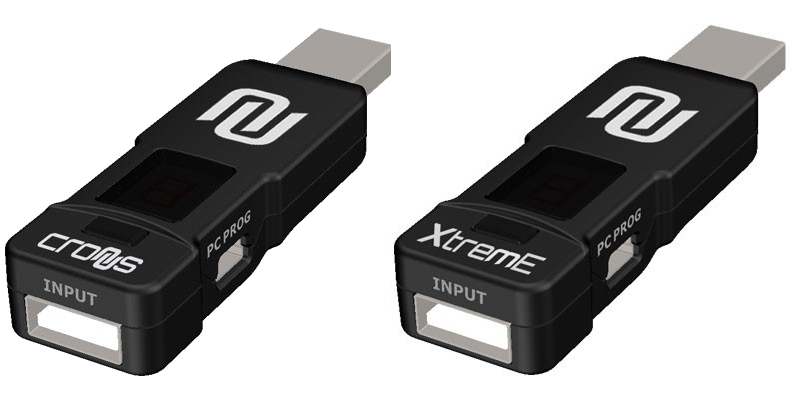 There are currently two versions of the Cronus device, the regular edition and the CronusX (Xtreme). While both feature compatibility for Xbox 360 and PlayStation 3 support between one another, included in the Cronus and CronusX is special button remapping in a special software program downloadable on the main site. Special to the CronusX are mapping packs for games like Call of Duty and Battlefield 3 for things like rapid fire and turbo knifing. I received the CronusX in the mail but aside from the extras from both, there are no differences between devices in terms of cross-compatibility and this review will focus solely on that main draw. I don't own a PS3 at home but much like my reviews for arcade sticks that are natively compatible on one console, I tested the 360 controller compatibility in my friend's local shop that has a working 1st Generation PS3 hooked up to a Sega Astro City arcade cabinet. This setup was made for both general compatibility testing and stress testing under playing conditions. While the default Xbox 360 controller (wired and wireless with the help of Microsoft's own receiver) works fine, this test was focused on using sticks that have a Xbox 360 controller license. Most if not all the sticks come from Hori and Mad Catz and their respective sticks use similar controller boards so it removes the need for getting all sticks. For Mad Catz, I used my good old Standard Edition FightStick. After connecting the Cronus Device first and waiting for the LED signal to light up, I connected the SE and works instantly with all buttons mirroring what's on PlayStation 3. The special buttons, turbo and Guide, also works too. The compatibility with the SE Tournament Edition FightStick, FightStick Pro, and FightStick VS should be able to carry over. For Hori, I actually didn't have a 360 Real Arcade Pro stick on me at the time but I did test using Hori's own Fighting Edge. At first I as thinking that due to some PCB changes and the addition of the LED lights and touch pad support, the Fighting Edge wouldn't even turn on. Fortunately after plugging the stick in, it worked normally. I was able to go to tournament mode and configuration mode in the Fighting Edge's touch panel and the side LED lights quickly flashes red when hitting or getting hit. I tested it using Super Street Fighter IV Arcade Edition Ver. 2012 in both training and versus mode against friends. I was able to perform normal and FADC combos with some characters like Ryu and Ken just fine when practicing or playing actively. During a tournament at the same place, I let people either test my stick or their own 360 sticks on the PS3 setup and play just like normal. They didn't seem to have any apparent issues as well. It's good that players didn't find much of an issue but there is a problem when using a product like the Cronus Device: Human error and the advertised claim that it's not laggy. Things such as mistiming a combo or setup can happen. To avoid that issue, a technical test must happen to see how it competes with other sticks based on signal processing. Thanks to the guys at Marvelous Customs, I was able to do this special test. Test 1: 25 trades, 22 counter-hits from ChImp, 3 counter-hits from Cronus. Test 2: 25 trades, 23 counter-hits from ChImp, 2 counter-hits from Cronus. From both tests, the results show that there are more trades than counter-hits but it's a bit surprising that the ChImp was closing in. While the counter-hits from both ChImp and Cronus featured a landslide victory from the former, the Cronus was able to catch up sometimes to provide trades and its own individual counter-hits. Players probably won't have much of an issue beyond the occasional and very minor signal lag from the Cronus similar to Toodles' test with the Qanba Q4/Eightarc Fusion and his Multi-Console Cthulu board where it had somewhat similar test scores. Someone asked me regarding the legality of the Cronus Device in tournament play. One of EVO's rules mention that "Hardware programmable input entry, rapid-fire, or other hardware assisted mechinsims are strictly forbidden." Fortunately, the Cronus device has a default option (shown in the device's LED light as 0) where there is no input modification or any other special aspect done by the device except for cross-console compatibility. I personally thought about price. The normal edition which most of us users would likely get costs $70 when compared to custom boards to allow cross-console compatibility that can range from $35 to $55. There is also the concern about professional installation which can cost a little more. Cronus achieves the convenience factor especially when it doesn't modify any internal wiring. Being a small portable USB device though, similar to the size of a common flash drive, there is the issue of possibly losing it somewhere while custom boards are always inside the stick. After accidentally dropping it, the casing came apart easily but was able to be put back with no issues so you will have to be careful with using as well. All in all, the Cronus device is impressive as a converter. Players will appreciate the ease-of-use, the straight forward compatibility, and safe from the issue of being super laggy like other converters in the market. 360 pad and stick players will now be able to use their own controller on PS3. Make sure to stay tuned to IPLAYWINNER when the update for PlayStation 3 stick compatibility on Xbox 360 consoles! The Cronus Device is available for $69.95 and the CronusX for $99.95 on the official website! Il est cher quand même. Ca a l'air intéressant, à mon avis le prix c'est par rapport à la taille. Par contre je suis d'accord il est chère et c'est ce qui est dommage mais techniquement il est vraiment bien comme accessoire. Et surtout no-lag.